To make sure that the PSA air separation assembly is provided with required stable and sufficient feed air quality, RICH`s own branded air compressor will be advised in accordance with our PSA technical experience or other brands as customer specified for air source supply. The compressed air offered by air compressor first enters the compressed air cleaning assembly. The compressed air passes through a Dryer to remove water, filters to remove dust and oil and it is deeply purified through an ultra-fine filter. According to system state, RICH specially designed a set of oil removing protector. This prudently designed compressed air cleaning assembly ensures the long service lifetime of molecular sieve. A part of treated cleaning air is used as instrument air. Functions: buffer and reduce air pulsation, reduce system pressure fluctuation, ensure stable AC air passing. It helps AC removes most impurity and reduces load burden of PSA oxygen/nitrogen separation system. 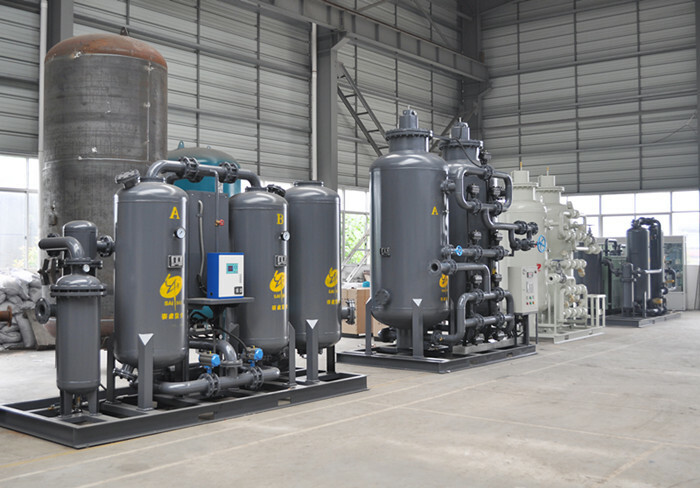 Meanwhile, when adsorption towers switch functions, air tank provides a large amount of compressed air which is needed for PSA equipment fast pressure increasing in short period of time. This process quickly increases pressure in adsorption towers up to working pressure and ensures equipment reliable operation. Nitrogen buffer tank is used to equalize nitrogen pressure and flow rate coming from oxygen/nitrogen separation system and to ensure stable nitrogen supply. Looking for ideal PSA Nitrogen Generators Manufacturer & supplier ? We have a wide selection at great prices to help you get creative. All the Nitrogen PSA Generators are quality guaranteed. We are China Origin Factory of PSA Generators. If you have any question, please feel free to contact us.